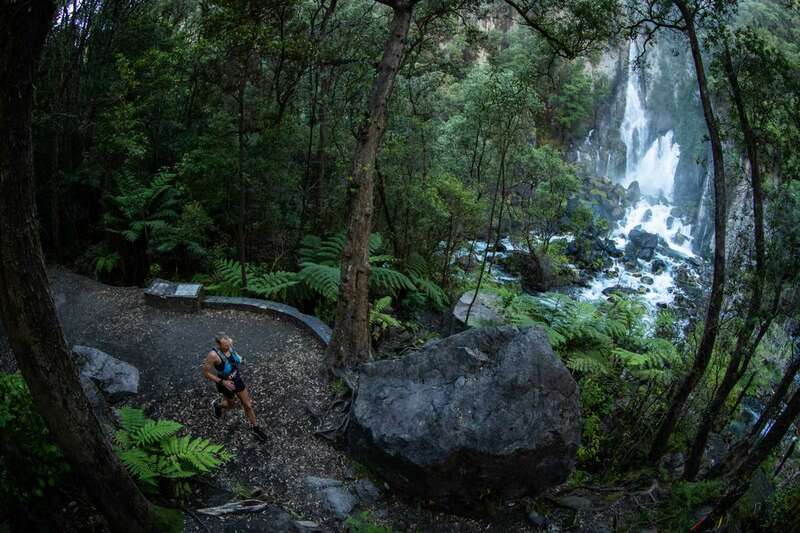 This week, we have the ‘run down’ from the Tarawera Ultramarathons in New Zealand, previews of next weekend’s speedfests at the Black Canyon 100k and FOURmidable 50k, and much more from events on several different continents. May this column help to spark joy in your Monday! Get your limited-edition iRunFar TNF Thermoball now! 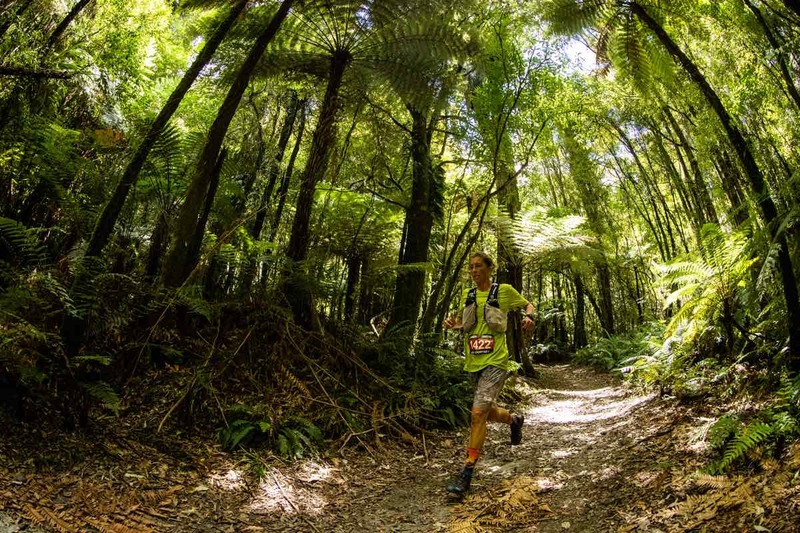 The Tarawera Ultramarathons had four race distances, including the traditional 102k (63 miles) race, which again was part of the Ultra-Trail World Tour, and a second-year 160k (100 miles). Courtney Dauwalter (USA) is off to a slow start in 2019. I mean, she’d already raced two ultramarathons at this point in 2018, and a third a week later! I jest, and Dauwalter’s 2018 form looks to have carried into 2019. She won the 102k race in 9:28, good for eighth overall. That’s 40 minutes better than what Kelly Wolf (USA) ran to win here in 2018. Next on Dauwalter’s calendar looks like the March 23 Behind the Rocks 50 Mile race in Moab, Utah. Second-place Stephanie Auston (Australia) came through in 9:49, and third-place Angelique Plaire (New Caledonia) followed in 10:39. 2:16 marathoner Reece Edwards (Australia) raced behind or with Cody Reed (USA) until late and then built a lead over the last 10k. Edwards finished in 8:22 to Reed’s 8:29. Though only matching his finish position from 2018, Reed did better last year’s mark by seven minutes. Harry Jones (UK, but living in Thailand) was third in 8:30, closing hard to finish less than a minute back of Reed. In the 160k race, women’s race winner Camille Herron and men’s race winner Jeff Browning were close all day, though they were technically not racing each other, but instead in two different races. Herron went out aggressively such that she was immediately ahead of all the women and men, suffered what she described after the race as a big bonk late race, and finished more steadily. Browning made a costly early race navigation error in adding more than four miles and 40 minutes onto his travels along the course, but righted himself and paced rather evenly from start to finish. Herron ultimately finished in 17:20 and more than five hours ahead of the next female finisher. Browning crossed the line in 16:18, more than three hours ahead of the next man. Both were in leagues of their own in setting new course records. It’s probably not meaningful, but let’s compare those times anyway to get a better measure of this course. Browning ran 16:18 at Tarawera. Last year he ran 16:30 at the Pinhoti 100 Mile and 16:45 at the Western States 100. The next Ultra-Trail World Tour race is the February 22 TransGranCanaria 128k on Spain’s Canary Islands. Air quality is poor in Salt Lake City, Utah and race director Jared Campbell is bringing attention to it. 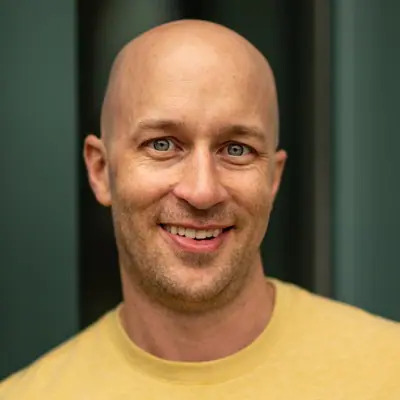 His Running Up for Air challenge has two race locations–one in Salt Lake City and one in nearby Ogden–and 24-, 12-, and six-hour fixed-timed races at both sites. The Salt Lake City race has 5.8-mile laps with 2,560 feet of elevation gain per lap, and the Ogden race goes six miles and 2,300 feet every lap. In Salt Lake, Katherine Brown and Joe Grant completed nine and 10 laps over 24 hours, Alexis Crellin and Jimmy Elam went for six and seven laps over 12 hours, and Tiff Schwartz and Cody Lind did three and four laps in six hours, respectively. And then in Ogden, Sylvia Greer and Ian Farris did 11 and 15 laps over 24 hours, Carrie Niederhauser and Gabe Joyes won the 12-hour contest, and Heather Carter and Mike Ambrose did three and five laps in six hours. Hong Kong, other than the U.S., you’ve dominated this year’s column. Three out of the last four weeks we’ve had a Hong Kong event included. Not a race this time, this one a challenge: the Hong Kong Four Trails Ultra Challenge goes 298k (185 miles) with something like 14,500 meters (47,500 feet) of elevation gain and a 60-hour cutoff while being solo and self-supported while on the four iconic Hong Kong trails it traverses. (Participants may receive aid between finishing one trail and starting the next.) It happened for the eighth year, but for the first time a woman finished. Nikki Han (UK, but living in Hong Kong) did it in 58:20. Men’s best Kristian Joergensen (Denmark, but living in Phillipines) finished in 55:22. Full results. I’ll admit, I had this Texas story pre-written, and then Kris Tyson went and required a re-write! The Lone Star 100 Mile would have been Karl Meltzer’s 42nd 100-mile win, by my count, and to make for his 19th-straight year with a 100-mile win. Meltzer and Tyson were together for much of the day, but Tyson broke away to win in 22:53. Meltzer finished second in 23:23. Women’s winner Alyson Kirk was a repeat winner, this time in 27:51. The event also paired with the The Franklins 200 Mile, and that sister race was won by Jessica Pekari and John Kelly in 71:21 and 60:53. Full results. A week after big brother, the Rocky 50 Mile race is another Tejas Trails event in Texas’s Huntsville State Park. Amy Ewing and Chad Lasater won the 50 miler in 8:23 and 7:22, and Kelly Swanson and Jaime Cortez won the 50k in 4:37 and 4:16. Full results. 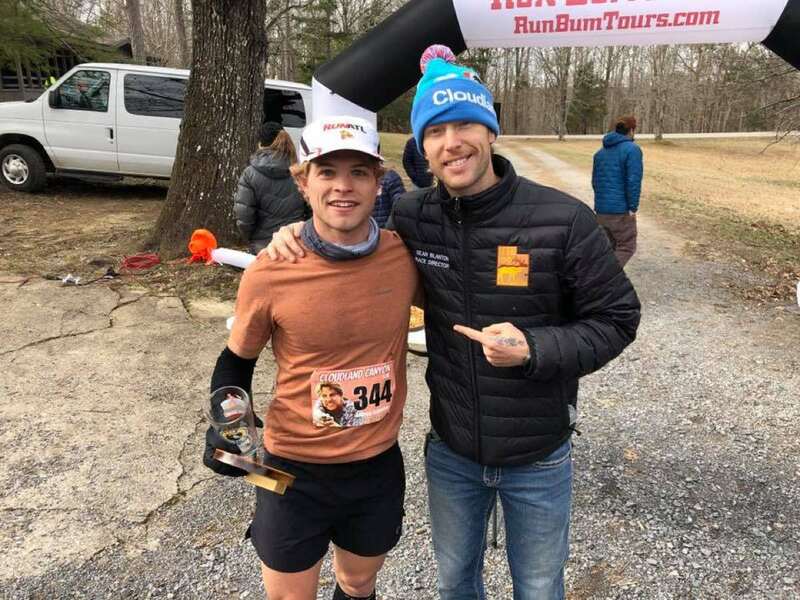 Run Bum’s Cloudland Canyon 50k happens in its namesake state park in northwest Georgia. Emily Ansick topped the women’s charts in 4:46, and Andrew Catanese won for the men in 3:45. Both were new course records for the third-year run. Full results. 23,486 meters, or 77,000 feet, that’s what Kilian Jornet (Spain, living in Norway) climbed while ski mountaineering for 24 hours at Norway’s Tusten Skiheiser and it’s a new 24-hour vertical world ‘best.’ Lars Erik Skjervheim (Norway) previously had the world best at 20,939 meters. It’s a Golden Ticket race, and so the first two finishers of the Black Canyon 100k will each earn automatic entries into Western States. Well, this looks good. Those Western States entries aren’t coming easy here. The FOURmidable 50k is again the USATF 50k Trail National Championships, and a U.S. selection race for the 2019 Trail World Championships to be held in Portugal on June 8. Bom dia! So long as the second-place finisher is within 10% of the winner, each of the top-two finishers will earn a U.S. national team position. The World Mountain Running Association World Cup doesn’t get the attention of other series with longer races, but it is among the most competitive and often attracts East African runners to its typically shorter and steeper courses. And for what we think is only the second time ever, the seven-race, seven-country World Cup includes a U.S. race in 2019. Buzz Sawyer, founder of the JFK 50 Mile, died Sunday, February 3 at age 90. Sawyer founded the race in 1963 and led it until 1993. It is now the country’s largest ultramarathon. Sawyer was also an accomplished distance runner, ranking seventh in the U.S. in the two-mile distance in 1959, as an Olympic hopeful over 10,000 meters in 1960, and as the JFK fifth-place finisher in 1993. He last contested the race he founded in 2003, at age 75. Something on your mind, or some race results you want to add to the tally? We look forward to your comments below. Were you at one of the races covered in this week’s article? If so, leave a comment to share your on-site commentary. How do you see the Black Canyon 100k and FOURmidable 50k shaking out next weekend? And who else are you watching on their respective entrants lists for a top run? Thanks. We’ve got both John Kelly’s and Jessica Pekari’s 200-mile wins noted above in the Lone Star 100 Mile bit. So Jeff’s time at Tarawera would have been 15:40 or faster? Fast course. Re: Cloudland Canyon and Catanese. Dude’s a really good artist, too. Are there any other people winning races and making great (non-running) art? For additional perspective on Courtney’s race at Tarawera Camille was 32 min faster in 2017 finishing in 8:56. I don’t know whether that was the full course? I assume it was though. Until last year, Tarawera started in a redwood forest at the edge of Rotorua, traveled roughly east, and ended in village of Kawerau, a decent net downhill. Starting last year, they flipped it around to start in Kawerau, travel west, and finish in downtown Rotorua, making a few changes to the route to get from the edge of town to downtown, and also traveling a significant net uphill. The new course direction is a slower direction. Great stuff Meghan. Courtney’s run was all the more impressive then! Courtney’s run was so fast, but I also think Camille’s run the year before, going 8:56 in the previous race direction, was also a helluva run (as was Ruby Muir’s 9:02 run two years before that)! It’s hard to compare the ‘old’ and ‘new’ courses as they are so different. For fun, results from 2010 going forward, http://statistik.d-u-v.org/eventdetail.php?event=50984. Conditions last year were pretty terrible with rivers of mud on the main climb. Still gives me nightmares…So Kelly Wolf’s time was impressive, maybe even comparable to Courtney’s? How much do conditions like that affect the runners at the front? An article I think would be cool would be one explaining all the different trail running federations and associations. During the season, it seems like every weekend there’s a race that crowns the world champion! Gonna be a good one out in the desert in AZ this weekend! Saw no mention of two of America’s best Walmsley v Krar in the FAST100k in Hong Kong? Course has been modified to 80k or 50 miles and start moved to Sunday, February 17. I thought a 100 miles was odd. Thanks for clarification. I suppose that is one way to look at it. The other might be to count your lucky stars that the US still has the rule of law and your race is unlikely to be skittled arbitrarily at the last minute. Jeremy and Valerie do a lot for the sport and are excellent humans. Seems Jim and Rob agree. 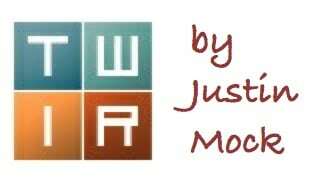 Justin generally previews the more deeply competitive fields of the upcoming weekend in TWIR. While there are two US studs at the FAST 100, it’s not all that deep. I’d guess that Justin covers it amongst the more inclusive race roundup next week. Alaska’s Susitna 100 mile and 50k Run, Bike, Ski are happening this weekend. Thanks for the recap and preview per usual!! As for my entry into FOURmidable… tbt. Came down with the flu last week, and has taken me out. I’m feeling better this week, but looks like it’ll take a miracle to get myself to that start line. Especially, after reading a past Irunfar post on the affects of the flu. Onwards and upwards. I appreciate you! More than just an affordable whiskey, watch out for Evan Williams at fourmidable. Could be top five unless he decides to wear crocs. I can’t read anything about Courtney without finding her shorts to be an overwhelming distraction. Has she ever addressed them in an interview?